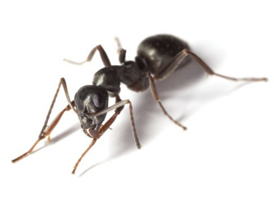 The black or garden ant is the most common ant in Britain. The worker ant is very dark brown, almost black, and about 5mm long. Ants nest - a nest site can look like a small pile of soil or dirt. While ants are not known to carry any diseases, they still spread bacteria, unhygienic matter and allergens in your property. They can also cause damage to phone, electricity and computer cables in your home. Ant bites are often painful, especially for young kids and babies. Ants are very difficult to get rid of without professional help. Our treatment requires a single visit.